Yesterday, another treatment done! Went very smoothly. I think my labs were good as usual. Coumadin level a little high but haven’t been tackling the greens as normal either. They reduced my dosage. Nice to see the warm face of a friend from way back when. If I didn’t mention, a girlfriend I knew from middle school is the pharmacist at the TxOnc where I get my treatments at. She comes and chats with me when I’m there. What a nice surprise that is–to meet up with an old friend from so long ago. I enjoy seeing her every time I go! Had nurse Pat this time. She rocks and literally saved my life as she was the one to recognize I likely had a blood clot. That woman is an amazing nurse! Ugh! So, over the weekend I developed an odd, itchy, red rash on the lower portion of my right breast. Take it from me, and as other women in survivor networks will attest, when you have BC, anything out of the ordinary will freak you out, especially on your breast. Seriously though, I feel like I’m always having to ask, “what next?” It’s like a tumbling effect. Once you have one thing happen, numerous other things tend to follow. I have to go in for lab work today and have called to see if my doctor or the nurse practitioner can fit me in just to take a look. I’m not seriously stressin’ about it because I’ve learned there’s no point in that. Just another thing I guess, but hoping it’s nothing serious. The good news is no severe chills or hot flashes. Maybe they were side effects of the steroids, which they’ve tappered me off of now. A number of people finished their chemo today. There’s a bell hanging on the wall at the front of the infusion room. When you’re done with all you’re chemo treatments you ring the bell and everyone claps and cheers. Quite a few rung the bell today. Yay! You go my fellow C-bravin’ peeps! Hope you all keep rockin’ on cancer-free! They had a party for one woman and were passing out cupcakes. Mine had Big Bird on it with the message, “pluck you cancer.” I just had to take a picture! The icing didn’t initially look like that. It was all swirly like on most cupcakes, but I started in on it first with my fingers taking a tiny bit at a time. 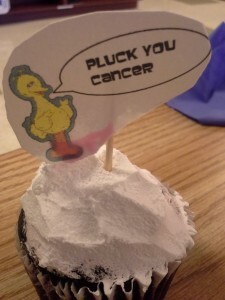 Now it kinda looks like Big Bird standing on a huge mountain (okay, not so huge, but Big Bird is a big bird) with his “pluck you cancer” flag planted firmly in the ground. Any minute now he’ll also belt out, “VIVA LA VIDA VICTORIOUS!” Well, you know, Big Bird is also bilingual. The cupcake was good too. Super Soul Sundays and how much we both appreciated Oprah for using her power to make the world a better place. the readings of spiritual authors Thich Nhat Hanh and Jon Kabat-Zinn, and other books to read such as Produced By Faith by DeVon Franklin, The Untethered Soul by Michael Singer, Radical Acceptance by Tara Brach and The Seat of the Soul by Gary Zukav. learning to separate ourselves from the little voice inside that is constantly speaking–Saying the good, the bad and the ugly to you every second of the day. This is a voice of judgment. It’s the critic overanalyzing every move you make. It’s fueled by every experience you’ve ever had, good or bad (I’ve found my little voice seems to mostly retain the bad, but I mean to change this!). Just being aware that you are separate of this voice gives you the power to tune it out or at least change its words! learning that true surrender is done with a smile, your arms flung open wide and head held high. It’s not an action of giving up downtrodden and hunched over. Humbled, yes. Beaten down, no. looking at our current circumstances (however fubar they seem at present–mine in particular) as avenues leading us in the direction our lives really need to go, and what actions we each need to take in our lives to get there. We each made a committment to take one small action, before October 1st, toward a more purpose-filled life. My action is to read The Untethered Soul by Michael Singer (of which I purchased two copies months back–one in hard copy and the other more recently on my Kindle). She had just finished it and pleaded that it is a must-read. Her action is to develop an advertisement and e-mail address for a like-minded, intention-driven, single parents group. I can’t tell you how much I appreciated our conversation and how afterward the vice I’d felt so caught in seemed to loosen. Even the glimpse of a different prospective on any situation can do wonders. Be Skeptical, but Learn to Listen: Don’t believe yourself or anybody else. Use the power of doubt to question everything you hear: Is it really the truth? Listen to the intent behind the words, and you will understand the real message. Mirror, mirror on the wall–A little kindness, please? So, now that I’ve been on blood thinners for the blood clot caught a couple weeks ago, my face has returned to a normal state of appearance. I can look in the mirror again without cringing. Its bizarre how physically distorted my features became; and no, I didn’t take any pictures! My stomach is now badly bruised from the twice daily injections. My doctor is transitioning me to Coumidan, which is a pill form of the blood thinners. Apparently, you have to watch how much vitamin K you consume while on Coumidan, i.e., leafy green vegetables. Since that’s my base diet, the nurse practitioner stated to continue as normal and they’d just adjust the level of Coumidan to fit my diet. I’ll just have to maintain consistency with the amounts of vitamin K foods I’m eating. Time to get into a groove, and I guess it beats dying from a blood clot. I was told I’ll have to stay on the blood thinners for at least 3-6 months. She stated the medication doesn’t actually take care of the clot. It just thins the blood and then your body resolves the clot on its own over time. My doctor also stated my port could still be accessed for treatment, as treatment through the veins in my arms along with taking the daily shots would be a bit much. So, last Thursday I had Taxol treatment as normal. It went rather smoothly. I initially started getting severe chills again. I requested two blankets which helped; but then I got up, grabbed my IV pole and started to walk around a bit. The chills then subsided. It appears movement definitely helps. I had a not-so-great visit with my doctor last week. The CT scan revealed more than I wanted to know. I couldn’t assimilate all of the information my doctor was spouting out. Then the conversation turned to a discussion about the best plan for surgery. Since my weight hasn’t significantly been reduced (I’d even gained 5-7 lbs with the swelling from the clot), she pressed me about having the mastectomies after chemo regardless of reconstruction timing. All the information was swirling around in my head. I was still trying to absorb everything. For days afterward I felt like I’d been placed in an enormous vice and it just kept getting tighter and tighter–Oh, the depression. Now I’m just trying to gain a better prospective on it all. A little good news–I’ve lost a total of 12 lbs since last Monday. Half of what was lost was likely from the swelling induced by the clot. My goal is to lose 3 more lbs by treatment Thursday. I had a setback last night with a margarita and some chocolate, but I’ll press on! I realize I haven’t been posting recently. Honestly, I haven’t felt up to it. I’ll rebound as there are things to post about. I guess I’ve just been in a funk. I was watching a movie about 9/11 last night and one of the characters said something that really hit home. I guess it was how very simple and beautiful it sounded. I can’t really remember the exact wording, but it was something like: “you never know what wonders are hiding in the people around you.” Meaning that we all have natural gifts, special skills, past events or connections, little know facts, unique qualities, etc. that make us fascinating to be around. What a true and beautiful statement! I mean, you’d think it’d be fairly obvious but most of us take this thought for granted. Something to keep at the forefront of our minds with everyone we come into contact with on a daily basis.